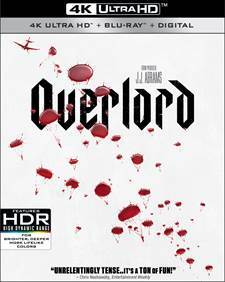 Download Overlord in Digital HD from the iTunes store. Listen to the Overlord soundtrack on Apple Music. Overlord images are © Paramount Pictures. All Rights Reserved. 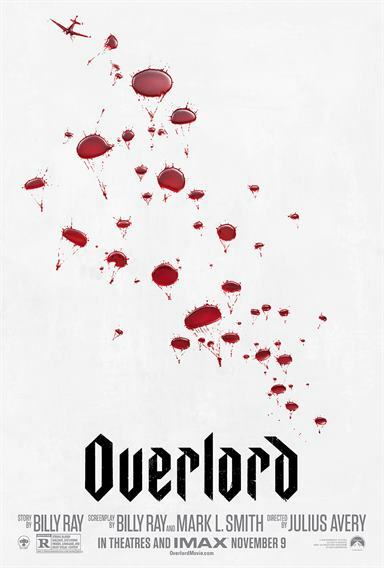 Overlord, which hails from producer JJ Abrams, is not your typical World War II film. While at first, when the film opens up to a scene we have seen many times before - soldiers on a plane waiting to jump to their targets - the story seems normal, however, once the soldiers hit the ground, we quickly learn that this is no routine mission. Led by Sergeant Rensin (Bookeem Woodbine; Spider-Man: Homecoming), the paratroopers' official mission is to destroy a radio tower in an old church located in Nazi-occupied Germany. After their plane is shot down before they reach their target, the survivors reassemble. They include Corporal Ford (Wyatt Russell; 22 Jump Street), Boyce (Jovan Adepo; Fences), Tibbet (John Magaro; The Big Short), Chase (Iain De Caestecker; Agents of S.H.I.E.L.D. ), and Dawson (Jacob Anderson; Game of Thrones). As the team sets out on their mission, they quickly lose Dawson and now the quartet needs to carry this highly dangerous task on their own. Once they reach the village where the radio is located, they soon discover that this is no run-of-the-mill task as something quite nefarious in the form of various Nazi experimentations, is taking place, which adds a whole other layer to this already complicated situation. The village is "ground zero" for the team - for not only their original mission but now the mission to save this village and destroy the evil laboratory with its horrific goings-on. During all of this, they also find Rosenfeld (Dominic Applewhite; The King's Speech), another paratrooper who had been captured by the Nazis. Working together, along with the help of a village girl named Chloe (Mathilde Ollivier; The Misfortunes of Francois Jane) they complete both of their missions, but not after losing more of their team members and covering up the truth about what they encountered in that church. When J.J. Abrams is producing, you know you are always in for a quality production and Overlord delivers. From a highly improbable plot that somehow seems to work to a solid cast and excellent special effects, this film is a high energy ride from start to finish. The 4K Dolby Vision video quality is the perfect vehicle for this venture because the gore and special effects are so well done that they seem incredibly realistic in this format (despite lots of green screen used to create the background). The Dolby Atmos audio is also exceptional with depth, range, and sounds aurally assaulting the viewer from all sides. Extras included in this bundle (on the Blu-ray) are the following: Creation: An overall discussion of all the parts that went into the making of the film including casting, crew, the script, training, set design and more. Death Above: A closer look into the film's opening scenes. Death on the Ground: A look at what went into creating and setting the tone for the beginning of the film, Death Below: This feature focuses on key locations of the film, such as the "underworld", production design and bringing the War and Fantasy/Horror film genres together for the story. Death No More: A look at the special effects for the film, including practical effects and props and Brothers in Arms: This feature takes focuses on the talents of Julius Avery direction and J.J. Abrams and the contributions of both to the film. With a "video game" feel, Overload takes a World War II theme and mixes it with a science fiction element to create something unique and unexpected. For this reason alone it is worth a watch but add to it the production values and you have something really special. While I will admit it wasn't my cup of tea (horror and gore aren't my kind of "thing") and the plot does have some lulls not to mention the unresolved love story at the end, the film has its merits and I can easily see it becoming a cult classic. Buy it and decide if you agree!